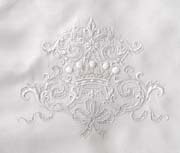 Monograms are motifs created by overlapping or combining letters to form recognizable symbols. 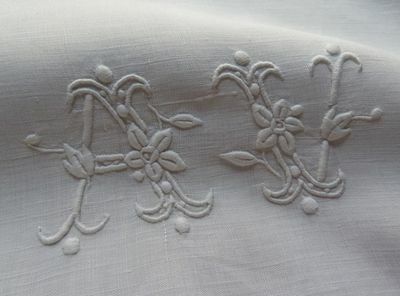 Embroidered monograms usually combine two or three initials of one or more individuals' names. 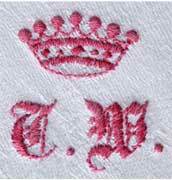 The use of monograms has a very long history. 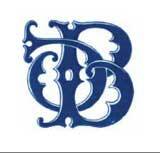 Human beings were using monograms as a means of identification before they used written language. In ancient times, monograms were used to sign art works or coins. In the middle ages their use spread widely as a signature. It's imporant to remember that most kings and emperors were not able to write or even to sign their own name! Neither Charlemagne nor Théodoric, king of the Wisigoths were able to write and instead used monograms. 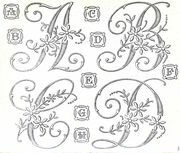 In order to signify power, monograms had to be formal and beautiful thus elaborate models were conceived by calligraphers. During the middle ages monograms were used to sign diplomacy documents and their study has an importance for historians, and yet today many remain enigmas. With the discovery of the printing press monograms were also adopted by printers, publishers and engravers for signing their work.